What is a Colorado Last Will and Testament? 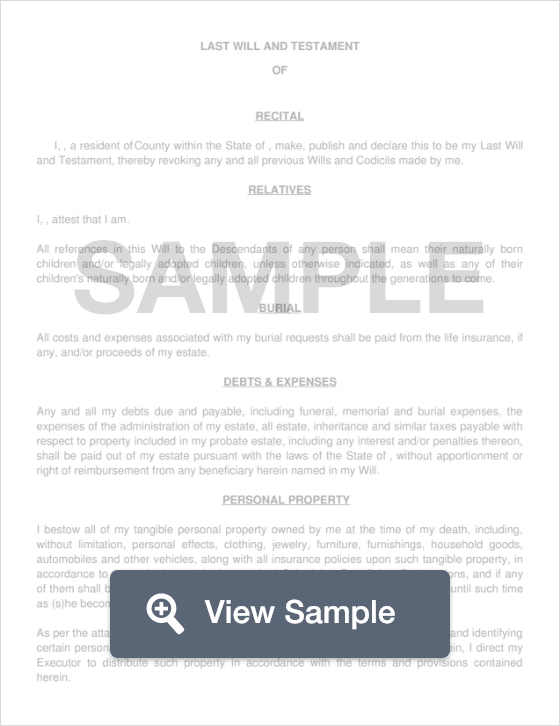 Colorado Last Will and Testament: What Is It? A Last Will and Testament is a document that allows you to communicate what you wish to do with your assets and how you wish for them to be distributed when you pass away. In the state of Colorado, these types of documents are legal once they either signed by two (2) witnesses, or by a notary public. Last Will and Testaments are also referred to as “Last Wills” or “Wills”. Here are the specific signing laws defined for the state of Colorado. Witnesses - According to §15-11-502, the Will must be signed by two (2) witnesses, or by a notary public or another individual authorized by law. Step 1 - Using the provided template, enter your name and gender. Step 2 - Specify the city and county of residence. If your selection is not ‘single’, state the name of your spouse. Step 4 - Declare if you have any children, pets, property, or life insurance. Step 5 - Provide the names of your living children and deceased children (if any), as well as which children will be named as beneficiaries. In addition, name your pets, and provide information about any life insurance (should you have any). Step 6 - Specify which property or percentage of property you would like to leave each child. Step 7 - If you would like to set up a trust for someone who is mentally ill or physically disabled, specify that here. A trust can prevent any interference with their ability to receive Supplemental Security Income and Medicaid benefits. Step 8 - Specify what age your children will be when they start receiving benefits from their trust, and what age they will be when their benefits end. Step 9 - Provide the information about the funeral home that you’d like your body taken to. Step 10 - Last Meal - Provide where you'd like the last meal after your funeral service. Additionally, if you’d like to appoint an alternate Executor, or if there is a person that you do not want to act as your Executor, provide their names and relationship to you as well. Additionally, if there is a person who you would not want to act as your Trustee, or if you’d like to appoint an Alternate Trustee, provide their name and relationship to you as well. Step 13 - If you have digital assets (valuable photos, copyrights, digital currency, etc.) appoint a person who will distribute these assets, known as a Digital Executor. Step 16 - Disinheriting a Beneficiary - If there’s an individual who you’d like to disinherit, provide their name and your relationship with them. Step 17 - Witnesses - Have both of your witnesses provide their name, address, and contact information. Remember that in order for this document to be legally recognized, it must be signed by all parties, including your two (2) witnesses. The state of Colorado allows you to forgo the two witness requirement if you choose to have your Last Will notarized by a Notary Public. If you choose to follow this path, you may bypass Step 17. Just be sure that you sign your document in the presence of your Notary Public.